What a difference a week makes! Last week, we saw Jeff Parker, Gabriel Hardman, Tom Palmer and Jim Charalampidis take on the Scarlet Smasher in the first part of a new arc due to introduce not one but four new baddies. Maybe I'm too used to the regular team after "Scorched Earth," because while we got a solid story that suited the "Marvel Point One" premise well, and breakdowns that kept the feel of the first arc, the finished art and colors didn't work quite as well. This issue, we're back to underrated artist Gabriel Hardman inking his own pencils, and Bettie Breitweiser bringing every page to vivid life with her colors. You want to know more? Well, that's why I'm here, aren't I? The cover to this issue asks the question, "Who is Zero/One?" and writer Jeff Parker begins answering the question this issue. In doing so he conjures up elements of his very first issue on the series. There's something of a master plan at work here, or at the very least, Parker knows how to weave threads between storylines to cause the Red Hulk the most stress from month to month. Zero/One's origin is something for which the Red Hulk can share blame with both the Leader and M.O.D.O.K. in a twisted fashion. She is both human and inhuman, in a study of dichotomies. Yes, she wants to destroy ol' Ross, but it also seems she has grander plans to set in motion. It's definitely going to be interesting seeing her finally meet up with the monster when that event occurs. "When the event occurs"? 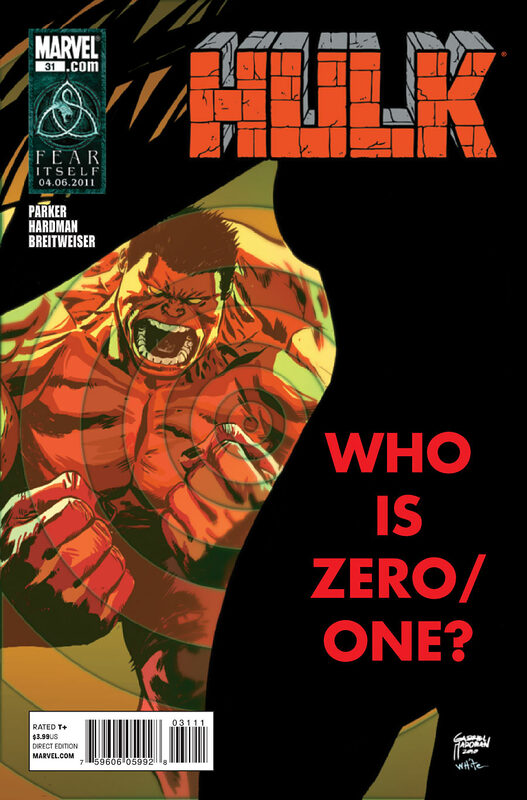 Yes, you heard me right--while nearly half the issue is devoted to Zero/One and her cause, the rest of the story is about Thad Ross and his attempts to evade another plan set in motion by General Fortean, a man who served under him but who now tasks himself with the destruction of the Red Hulk, whoever he may be. The two sides don't actually meet this episode. It's in the Red Hulk sections that the story treads water, with Ross talking about his new situation and taking on rock golems created by military technology. Yes, it's all part of Fortean's attempt to gain greater knowledge about the creature he wishes to destroy, and it would fall flat in less skilled hands. As it is, Jeff Parker's wit drives the character-based scenes, and Gabriel Hardman's art holds great interest during the battle. Ross has a funny scene reminiscent of the savage Hulk of the 1970s involving a group of men holding a barbecue event that alone is nearly worth the price of admission. 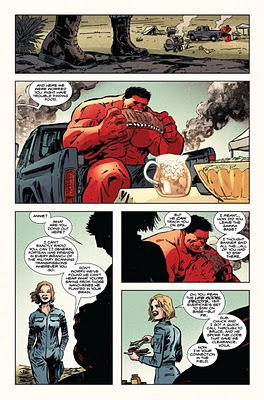 Also, Red Hulk's traveling companion, the LMD Annie, provides a good sounding board, as Red confides that maybe telling Fortean about his double identity would have been a mistake. That indicates he probably won't use that bit of information anytime soon--a good call in this case, too, because I think there's still much mileage to be had from keeping Ross' secret out of anyone but Banner, Steve Rogers, and the LMDs' hands. As far as the back-up feature, "Save the Date," goes, Jeff Parker constructs a story that teams A-Bomb with both of the She-Hulks that appears to again be more about setting up other events than providing a story with a set beginning, middle, and end. It's a good enough adventure as scripted by Parker and drawn by Tim Seeley (of Hack/Slash fame), and certain to be a springboard to future events in the Hulk's corner of the Marvel Universe. The best thing I can say about it is that it takes another step backward to embracing Lyra's roots and elements that seemed to be erased for the She-Hulks miniseries. Hello, Boudicca! This issue combines the seriousness of Parker and Hardman's Red Hulk stories with the lightheartedness of A-Bomb and the She-Hulks. I have to say I'm thankful that next month, Hulk returns to $2.99 with only one story and no back-up tale. It's true that the stories in the back have contributed to the ongoing plots in the main feature, with the A-Bomb stories in the first three segments leading directly into the final two main segments of "Scorched Earth" and the two-part Watcher story introducing the Omegex, which continues to trek to Earth in this issue. Parker did his best to make the tales matter, but I think we'd all like to see full focus on the Red Hulk as long as he's in this title. This one's recommended, folks. To be honest, while the story and writing by Jeff Parker is excellent, I still don't really like Rulk. What puzzles me even more is that Red Hulk gets a long running series, and yet Skaar, who is a character I want to read more about, hasn't been given a long-running series. I only hope that Skaar: King of the Savage Land sells, in hopes that Skaar does get a long running series of his own, for I prefer Skaar over Rulk anyday. The same can be said about Greg Pak's Silver Surfer series, which is starting out great, and I hope it too gets to become a long running series. What do you think, Gary?